How to distribute Mathematica packages as paclets? Mathematica does have a nice package manager. Packages are called paclets, and they can be managed using the functions from the PacletManager` context. How can I package up my own packages as paclets, and manage their installation? The following answer is not complete, but does give one possible solution. There's a lot more to learn about the paclet manager, so please contribute another answer if you can, or correct this answer if you find any mistakes. I originally posted this on Wolfram Community, following a nice tutorial by Emerson Willard on how to create paclets using Workbench. Most of the information is derived from studying GitLink. To use Paclet Manager functions, it may be necessary to evaluate Needs["PacletManager`"] first. 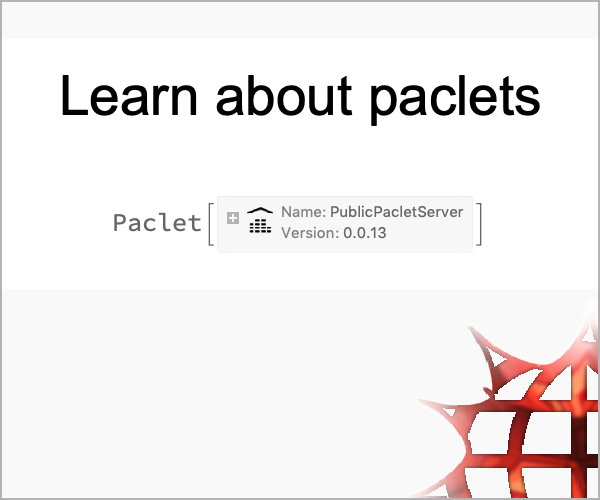 Packages can be bundled into .paclet files, which are easy to distribute and install. .paclet files appear to be simply zip files that can contain a Mathematica package or other extensions to Mathematica, along with some metadata in a PacletInfo.m. The metadata makes it possible to manage installation, uninstallation and updating automatically. I'm going to illustrate this using MaTeX. It is my smallest published package, so I used it for experimentation. How to add the required metadata? First make sure that your package is following the standard directory structure. Context sets the context of the package. Whatever you put here will be recognized by Needs and FindFile, but ideally it should also be compatible with the package name and the standard file name resolution. Root sets the application root. FindFile seems to resolve the context to a path through this, but also following the standard rules. Of course you can also add the "Documentation" extension to integrate with the Documentation Centre, but that is not required for the functionality I describe here. How to bundle a package into a .paclet file? Simple use the PackPaclet function on the application directory. It will use the information from PacletInfo.m. It is a good idea to remove any junk files and hidden files to avoid them from getting packed up. Warning: Before doing this, make a copy of the application directory. Don't accidentally delete any files used by your version control system. While this Paclet expression is formatted concisely, it contains all the metadata from PacletInfo.m, plus its installed location. You can see all this by applying InputForm to it. How to work with paclets during development? During development we don't want to pack the paclet and install it after every change. It is much more convenient to be able to load it directly from the development directory. After this Needs["MaTeX`"] will load the dev version. As a proof of concept and an experiment, I started distributing MaTeX in this format. You can use it as a reference in addition to GitLink. Szabolcs answer shows how we can build a .paclet, but the PacletManager also contains the possibility to serve packages from an own site. As I realized after writing this, most of the information here can also be found in this Wolfram Community post, a link contained in Szabolcs PacletInfo.m documentation project. that is an expression with a Head PacletSite and as arguments a Sequence of Paclet expressions, which are basically the same as what is in a PacletInfo.m file, although I think you will need strings as labels here whereas the PacletInfo.m wants symbols, or at least some of the (java?) functionality that uses it like PackPaclet. Upload that and the paclet files to the server and test whether you can download them e.g. by visiting (of course you'll need to fill your own urls) "http://your.pacletsite.url/PacletSite.mz" and "http://your.pacletsite.url/Paclets/PckgName-1.0.0.paclet"
If that works you are set to experiment with the paclet manager. Note that PacletSiteAdd will add that url permanently, that means it will persist in the next session, you will need to use PacletSiteRemove to get rid of it. As Szabolcs and Sjoerd C. de Vries have mentioned in their comments of course installing from an unkown web source has security issues. So when installing from external sources always be careful and act with a decent measure of mistrust. The described setup does not actually add additional insecurities (you can already download and install Mathematica code from websources in other ways), but it of course makes it somewhat easier to get trapped into running malicous code. your own computer and the DNS servers you are using that they correctly resolve the paclet-server address and not redirect to a malicous server. What package managers for other languages or OS distributions usually do is to provide a certification mechanisms which make it much harder for malicious code to sneak in without the package provider realizing. AFAIK such a mechanism can prohibit attacks to 2. and 3. If you want to extend Albert Retey's answer to just use Wolfram tech you can set up your server in the cloud. I just set this up for myself as a proof-of-concept and it seems to work just fine. Get a free cloud account that you can put these into. Obviously restrictions will apply to the size of the packages you can distribute and whatnot, but looking at the pricing page you get .2 GB of space which, if you're mostly moving code base, not data, should suffice. If not see this answer to see how we can set this up using Google Drive too. The basic trick is to put up your paclet but provide an HTTPRedirect to a Google Drive download link. Generate your application(s) that you want to move. I took some stuff I've developed, including the package that has the code that pushes to a cloud paclet, in an application I called AppSampler. Configure it like you were gonna push to, say, GitHub, but now instead we're gonna push to the cloud. It's really just that last step that's in any way important, as it allows the paclet manager to access it. If I remember correctly from testing "Private" also works if you're on your own cloud account. Alternatively you can share with a group of people by setting up a PermissionsGroup. And then PacletInstall@"AppSampler" will pull in the paclet. The great part of this is that it is a) free until WRI decides otherwise and (critically) b) possible to do entirely from Mathematica without having to link to any external resources. There's something on the pricing page about a 30-Day limit on deployments, which is maybe applicable here -- does CloudDeploy count if it's really just to make the file exist for CopyFile? If it does that's a draw back, but probably non-fatal and at the very least this is still super convenient for temporary deployments. These paclets seem to survive in perpetuity. Not the answer you're looking for? Browse other questions tagged packages development paclets or ask your own question. Can I build my own curated data function? How can I use GitHub as a paclet server? How to put Mathematica Notebooks and packages on Github? How can I install packages distributed as .paclet files? How to make Mathematica automatically find packages in subfolders of the Applications directory? Making a Mathematica package manager?